We heard feedback that the current processes for creating secure clusters were complex and time-consuming. Based on your input, we've added the ability to create secure clusters directly from Visual Studio. This update shipped with the latest release of the Service Fabric tooling for Visual Studio 2015 and with Visual Studio 2017 as part of the Azure workload. One of the main features of the latest release is the experience in Visual Studio for creating a cluster from the "Publish" dialog. This feature will allow you to modify the settings for the cluster, create required supporting resources, and generate the security certificate needed to create a secure cluster all from within Visual Studio. It will also import the security certificate to your local development machine so you can publish and troubleshoot your application in the cluster. This allows you to go directly from developing your service fabric application to testing it in the cloud without having to switch context. When the cluster has been created, Visual Studio will indicate this in the Output window. 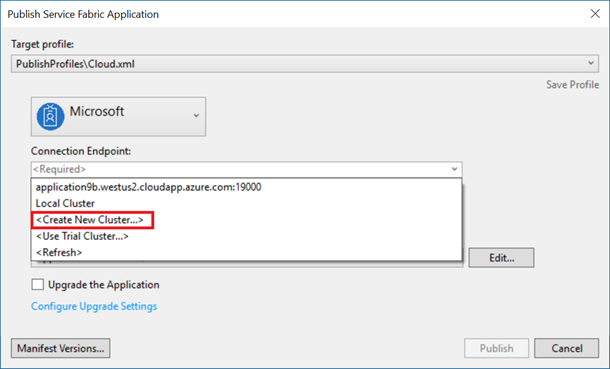 You can try out this feature yourself by following the steps in the tutorial "Deploy Your Application to a Cluster". Below are screenshots of the new experience in Visual Studio. You can see most fields are filled in by default. 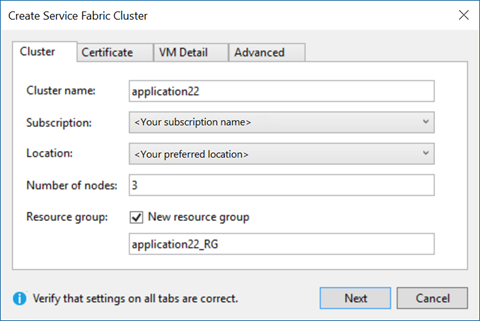 However, you can still modify some of the most important settings for Service Fabric clusters, such as the number of nodes, the VM image, and the AI where you want to log telemetry (if you choose to do so). Let us know what you think of this experience!